Browse > Home / Let’s Look Inside an Ajijic Home, Want to? Let’s Look Inside an Ajijic Home, Want to? From time to time we show actual homes for sale. I don't list homes as a "Buyer's Only Realtor". And, I'm not pushing this one at all, but the agent took the time to do a video and it's fairly representative of homes in Ajijic village in this price range. Here's the "Listing Agent's" description. "The perfect village home, centrally located and one ½ block to the Malecon! It’s all here: Two over- sized bedrooms, both with en-suite baths, plus a ½ bath on the lower level for guests. The kitchen was remodeled only months ago, as well as the entire outside terrace converted into an amazing great room ~ the perfect entertainment area if you do not wish to eat in the separate dining room off of the kitchen area. There is also a small living room on the main level. Up the gentle staircase you will find the second Master Bedroom and Bath as well as an office space and this fantastic new great room which has covered gentle stairs leading up to TWO Miradors. One Mirador is covered, one is not. Both have fabulous Lake and Mountain views. All this for $134K!! There is off street parking in this one last block of this street before the lake. As you head up the 5th of Febrero, it becomes Las Salvias; so the potential is here. This part of the street is still in the upward spiral of new homeowners who will remodel as this homeowner did." Hope you enjoy this sneek peek at an Ajijic Village home. Spectaclular Chapala – Ajijic Lakefront Home ! 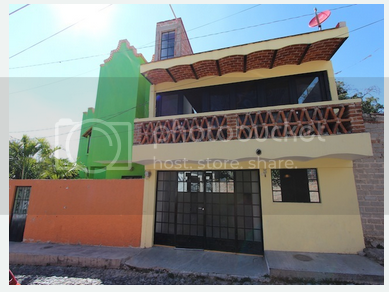 Nice Affordable Low Maintenance Home in Chapala, Mexico ! Great casa! You should be able to sell this one very fast! thanks for sharing. Beautifully done! How many sq. ft. is it? This is just one of many homes for sale in Ajijic. I do not take listings. I’m an Exclusive Buyer’s Only Realtor. my disclaimer to the article. Beware” situation. Just one of many reasons to use a Buyer’s Only Realtor. Thanks for taking the time to comment. Let me know when I can be of help. Hi Barry, If I recall correctly the listing shows 1800 plus (but this would include both up and down stairs, covered porches and even garages. Please also take a look at my reply to Yvonne above about this house and homes in general in Mexico. water supply, high speed internet access. cable TV access, disclosures that would be required in the USA or Canada, etc. My job is to make my clients dreams come true, not let them buy a nightmare. My wife and I had already seen the video and we were both impressed with it. Hopefully we will find something as nice when we make the move in a few years. Beautiful! I hope to make the Lake Chapala area my retirement home in a few years and would love a home like this one. Beautiful! It’s a bit strange having the kitchen and living room on different levels, but that’s okay, more exercise! And I love the Miradors! I would spend a lot of time up there. Hi Roy, We have an active market most of the time. for various reasons all the time. Some large homes have 2 kitchens. The main one and another on or near the covered 2nd floor verandas to make it easier on the everyone.